Categories: Bryson, Family, Matthew, Wordless Wednesday | Permalink. 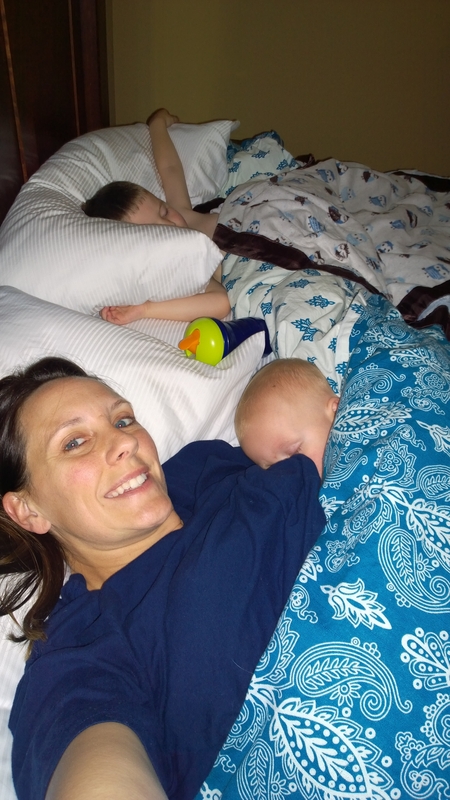 Someone asked me the other day if I still nap with both boys every day. It’s hit and miss, and Bryson is sleeping longer in his crib now so most days, he’s really ready to be up when he wakes up. This works well for my workout schedule but not so well for my need for snuggles. Bryson took a nice morning nap and was due at 1:45 for his afternoon nap. He actually laid down on our bedroom floor as I got Matthew in bed. By the time I got to Bryson, he was overtired and punchy. He wouldn’t nurse, he wouldn’t sleep. He screamed bloody murder for me. 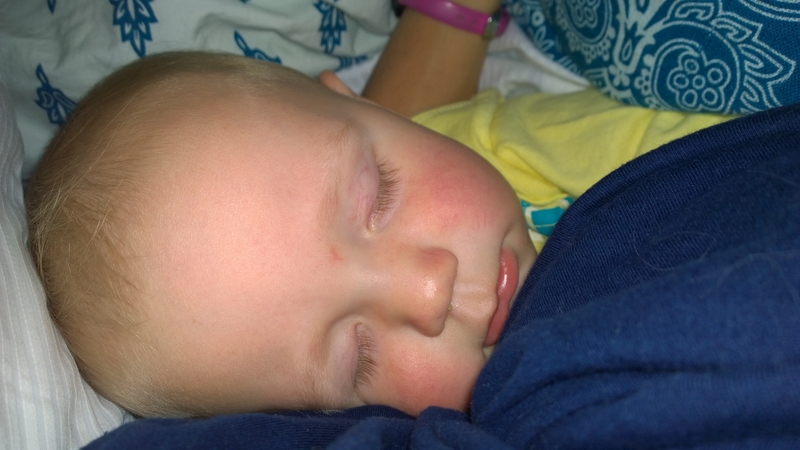 I went and tried nursing again and that time, he dozed off… But screamed again when I put him in the crib. He’s in bed with us now. It’s magical and perfect and I know these days are numbered so I’m embracing it! 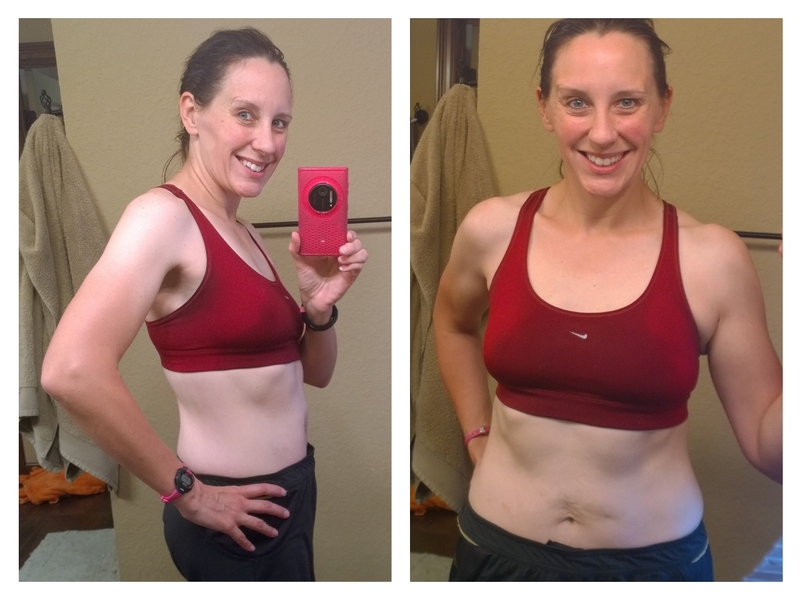 I read a blog post on Tuesday that blew my mind – and may have changed my life! This sounds dramatic, but it’s true. KeAnne, from “Family Building with a Twist,” posted about an art project she did with a group of gals while sipping on wine. I had never heard of such a thing, but quickly looked into it because A) I am crafty and LOVE the next new art challenge and B) why the heck not???? 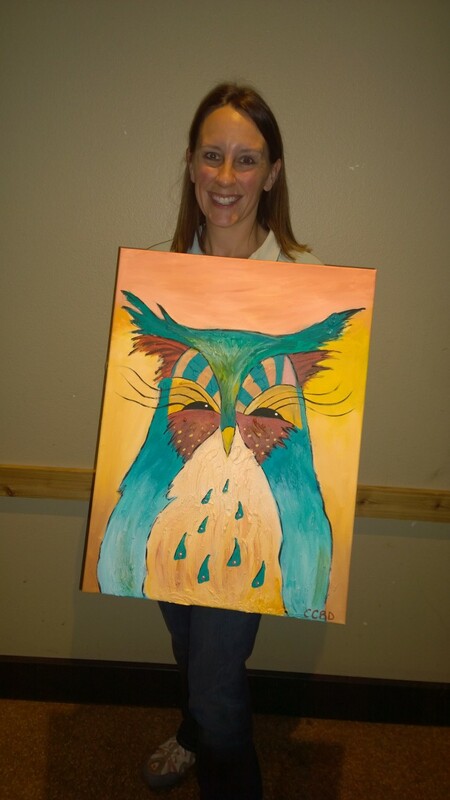 I immediately found 515 Wine With Design here in DSM and their project coming up in just 4 days was a teal and orange owl canvas. PERFECT for Bryson’s room. I painted my owl today and it is just what I wanted for Bryson’s room. It is awesome and it turned out great (I have no problems admitting when a project turns out as I’d hoped, and I have no problems admitting when they don’t!). I was the only person there without a friend, which was fine by me because I had an owl to paint. 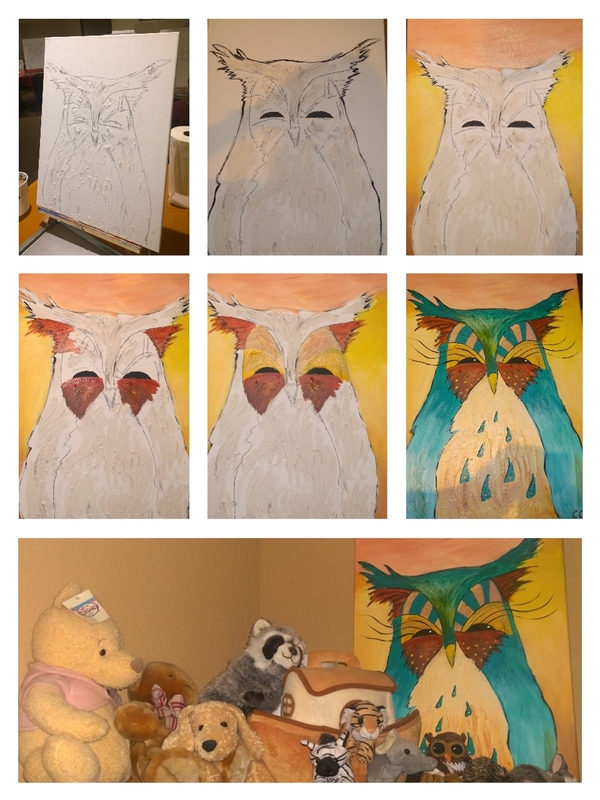 Like KeAnne’s project, the owl was pre-drawn on the canvas and Marcy had added texture to the canvas already. All I had to do was paint it, and instruction was given on just how to do that. There was a gal there who was a professional painter and boy was her finished project something to admire! I loved seeing how everyone made their painting their own and I was thrilled to come home with a painting that, quite honestly, I probably would have paid a lot of money for had I found it for sale somewhere. Hottie loves it and Matthew thinks it’s pretty cool that Mommy painted a picture for Bryson’s room. Now both boys have paintings in their rooms that I’ve done, and that makes me happy! Thank you, KeAnne, for posting about your beautiful painting! Without you, I would not know about this new social experience that is sweeping the nation! I started taking photos step-by-step, but that became difficult and I just got down to my task at hand – painting! Pounds Lost or Gained: 1.4 Pounds lost since last week, but even with Week 5 (148 pounds) – so 0? Food: We went to my brother-in-law’s garden to harvest veggies and came home with lots of beets, butternut squash, and carrots. I’m going to be making soup out of them this week – so I’m hoping that helps to trim me down a bit. Tuesday – Butternut squash soup (fresh squash from my BIL’s garden = AWESOME!) – I made some of the modifications noted in the comments and it was awesome, but next time, I’ll be using sour cream or Greek yogurt instead of the cream cheese. Froze 4 servings! Wednesday – Beet soup (fresh beets from my BIL’s garden – 3 pounds of them!) – I used beef stock instead of chicken stock, added some goat chees with garlic and herbs, and used 0.5 cups of heavy cream instead of the half and half. Froze 8 servings! Exercise/Activity: I’m planning on running quite a bit and walking with the boys – I need to get more steps in! The first half of the week is going to be beautiful, and I’m planning to take advantage of it. I will also go for 7 hours of good activity again – I think 7 hours is a great goal not including walking. I am taking this week very, VERY seriously to get back on track. I have been slacking a bit in the steps department and it’s a beautiful week ahead here in Iowa, so I plan to get outside! My diet needs to get better – cleaner – and I’m working hard on that. I had fries on my free days in the last two weeks, and that’s just not good. Cupcake day is worth the splurge though. We go once a week, and I look forward to it ALWAYS! While walking into the Y on Thursday, I thought, “why am I walking the track when I could easily be running?”. Enter the treadmill! I ran 2+ FAST miles before my weights class and 1.5 decent-paced miles afterwards. I’ll be doing that every Thursday and/or Friday, if possible! Back to 148 pounds (and 147.2 this Sunday morning)… Whew! I’m so excited to be under 24% body fat! Good things are happening all over my body. My abs are starting to take shape, my saddle bags are shrinking, and my arms and legs are becoming more defined. I’m thrilled! … Now under 24% body fat! Flexed abs, but not sucked in. Progress! Food: Hottie is back in town for the week – so we are cooking again in this house! Sunday – Free day – came home from night away without kids so kept the party going with baaaaad-for-me pizza! Monday – Hottie brought home cheese and crackers – the fancy good kind. That was dinner (and wine). It was good! Exercise/Activity: Sunday was set to be a rest day since Hottie and I would be driving back from a night out of town without the boys. This means that there is a lot of time to make up to hit 7 hours of good activity! Bryson needed a morning nap after dropping Matthew off at school on Monday, so we came home. He slept over an hour and I did 66 minutes of INSA.NITY before waking him to get Matthew. That worked out and I hope to do that again! I’m sacrificing steps for more calorie-burning activities like longer cardio and strength sessions. I don’t feel good about it, but I need to burn some fat this week! I finally got a GOOD strength day in – I’m feeling it more than 24 hours later. PAIN = happiness! 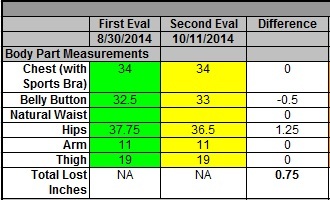 I didn’t get measurements last week, so I did them today. Progress… See below. The gals who measured me at the gym pulled the tape tighter than I do, so the waist is still confusing me as to how they ever got 32.5 (belly button waist). I have gone down one pants size (from a 10 to a comfortable 8 in the same jeans) and one tops size (large to a medium in the same shirt) after the first 5 weeks of this session. I’m happy with that and honestly don’t think I care to get into a 6 – too much pressure.